The Better Business Bureau Busts Consignpro Again! The BBB Busts Consignpro Again! There's just one person making all the decisions at 'Consignpro' and over the years the decisions have included employing illegal tactics in hopes of increasing sales. His one-man show was never investigated by the BBB, much less granted 'accreditation' or awarded an A+ rating. Click here to see the authentic BBB page on Conpro. 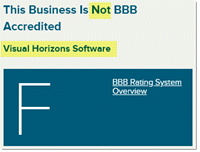 Now a year later the BBB department responsible for fairness in advertising has come down on Wilson again for displaying false claims about a competitor, clearly making the false accusation that BCSS software is sold by 'Net Money Business' (which is it not) and attempting to conflate an old F rating for 'Net Money Business' with Best Consignment Shop Software (which is rated A+ by the BBB).